If you have a specific disease or health condition and would like to know which Chinese Reflexology points are best for you, this article will point you in the right direction. 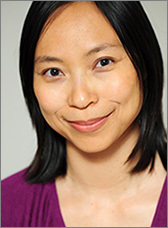 I often receive questions from people who have a specific disease or health condition asking for my advice on which Chinese Reflexology points I would recommend for them to massage. Many times, the question is a single line without any further details. Other times, readers will provide a very detailed description of their health issues and they’ll also include a friendly hello and note of thanks. Regardless of the level of detail in your message, it’s impossible for me to recommend the best points for you to massage just from reading an email message. 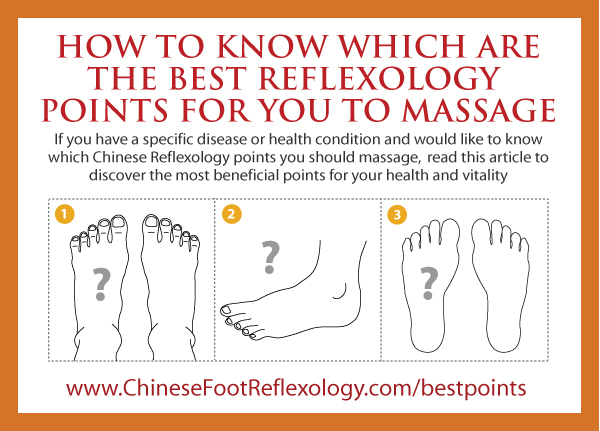 The best way to determine the best points for you is to see you in person and to go point-by-point testing each of the 50+ reflexology points on your feet. 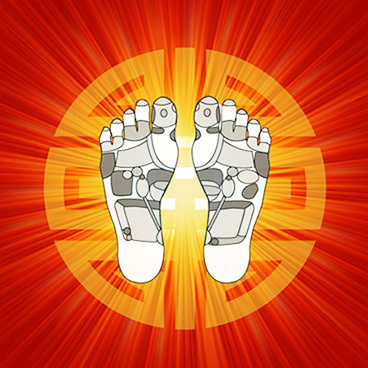 The sensitivity of the reflexology points on your feet combined with fundamentals of Traditional Chinese Medicine give me a big picture view of what’s going on in your body at the energy level. Your feet will tell me things that you might not even be aware of because it’s all happening at the energy level. It’s amazing—the feet always tell the truth. Many years ago, I attended a “healing exchange” for healers where we traded services with each other. I gave a reflexology session to a medical Qi Gong practitioner. Interestingly, when I massaged the reflexology point for his thoracic spine, it was extremely sensitive. I asked him if he had any back issues or sat at a computer a lot or did anything that would affect his posture. He insisted that he was 100% healthy, had no stress, meditated all the time and there was no reason why that point would be sore. Since it was a healer exchange and we were doing this for fun, I didn’t press the point (haha, bad pun intended) even though the sensitivity of his reflexology point suggested a significant energy block in that region of his body. Later in the evening, I observed him meditating in a kneeling position. His back was awkwardly hunched forward exactly at the vertebrae level that had shown up as a sensitive point on his feet. Yup, you can’t hide anything going on in the body, even from yourself, once you learn Chinese Reflexology. That said, if I can’t see you in person, the next best thing is a detailed back and forth exchange to learn what is going on in your body and your life. However, because my site has grown so much in the past couple of years with tens of thousands of visitors each month, I am no longer able to answer all of the questions I receive. I do want to emphasize though that Chinese Medicine is about healing the body as a whole and looking at each person as an individual. There are so many elements that affect the flow of Qi (energy) and a back and forth exchange helps to pinpoint what may be affecting your Qi. This approach differs significantly from the Western medicine approach of focusing on the affected area or body part and recommending the same treatment plan for everyone. For example, someone with psoriasis would be given a skin ointment by their doctor. On the other hand, in Chinese Medicine, psoriasis is often related to an imbalance in the Kidney or Liver channels and massaging these points would be more important than massaging the point that corresponds to where the psoriasis is showing up on the body. In Traditional Chinese Medicine, diseases often have multiple underlying causes and each person may have a different combination of Qi disharmonies resulting in a particular condition appearing in the body. When I write articles about different health conditions such as headaches and migraines, I write about the most common Qi disharmonies and points that can help. The articles are a good starting point. They give a quick overview that will have some benefit to most people. However, because of the interrelatedness of the organs and systems in the body, obviously they’re best used as a starting point for healing the body as a whole. Ironically, a “quick overview” article is often 2,000 to 3,000 words in length. Each article takes me about 6 to 8 hours to write. This makes it pretty much impossible for me to answer everyone’s email personally. As a full-time mom, I would not sleep—you’d have to clone me about 100 times over!!! Whoa, just imagining what I could do with an additional 6 hours of free time makes me dream of spa days that I have not seen since the birth of my son :). Because I can’t answer your question personally, that’s why I’m writing this article to point you (ooh that’s another bad pun) in the right direction so that you can turn your health around. Chinese Reflexology is incredibly powerful for self-healing, so here’s what I recommend for the best points to massage. This applies to everyone irregardless of what ails you. If you have a health issue, please see your doctor first. Regardless of what is going on in your body, it’s important to rule out any serious problems and get a proper medical diagnosis. It takes time to bring your body back into balance as a whole. Sometimes you need the antibiotics to thwart the bacteria and then you can focus on healing and strengthening your body with Chinese Reflexology. You can also practice Chinese Reflexology in tandem with your recommended treatment. If your condition is serious, it’s best to check with your doctor whether it is okay for you to practice reflexology. If there is no cure for what ails you or if the doctors are unable to figure out what’s going on, Chinese Reflexology is good for turning things around at the energy level so that healing can occur at the physical level. Healing happens by supporting your body’s natural ability to heal itself. This takes time and you have to massage your feet consistently. There are dozens of article on my website so I may have already written an article about the condition that you’re looking for information on. Way back, I had an issue with getting a search box to show up properly in the menu bar, so I deleted it. However, I recently figured out how to add back the search box to the side column. So, if you don’t see what you’re looking for in the links under the “Categories” section in the side bar, try searching for it. 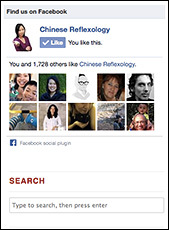 You can find the search box just below “Find Us on Facebook” on the right column of the homepage. There’s only so much information I can pack into an article. I can easily fill an entire 60 to 90-minute workshop full of information and instructional videos on almost any topic. There may be a webinar or self-study guide that applies to your situation with detailed instruction, videos, explanations and recommended points for addressing the condition. You’ll find upcoming workshops announced on the Workshops and Courses page. I record many of my workshops and because they’re taught online, the experience of watching a recorded webinar is very much like participating live. Instant access webinars and learn-at-home guides are available in the online store. And did I mention that all digital downloads come with a 30-day moneyback guarantee? Once I finish writing my book, I’ll have more time to cover more topics in workshops and classes. I occasionally run a poll where I tally up the most popular questions and put them out as a poll for readers to vote on. That way, I can help the most people by writing an article on the most voted-on topic. If your topic of interest is not in the poll, it doesn’t mean that I won’t write about it. I’m always looking for ideas for articles. Here’s a link to the December poll. Voting is now closed, but I’ll be periodically announcing new polls in my newsletter and on my Facebook page. You’re also welcome to add your question to the comments section of the poll. That’s the best place to write them as I find it tricky to keep track of comments when they’re made at different times and on different pages all over my website. Okay, I bet that got your attention! This is a special step if you’re in panic mode and feel like you need help immediately. When you are afraid, feeling desperate and/or hopeless, there is absolutely nothing that I could share that would be of greater benefit than what you’ll read in the next few paragraphs below. You have to calm yourself down first. When you are in a state of fear, this cuts you off from your life force Qi. It keeps you from thinking clearly, but more importantly, it keeps you from accessing the wisdom of your intuition and higher guidance. This is where the answers lie and the motivation and inspiration to take action. Fear is paralyzing and shuts you off from that which could help you. You could have the “miracle cure” sitting right in front of you, but this state of mind would prevent you from seeing it or receiving it. The common misconception is that “curing” the physical issue will result in the panic dissipating, but the truth is that it works the other way around. First, you must release the fear. When you are calmer, you can then take constructive steps to heal. This also applies when you want to help your loved ones. If you are in panic mode, the best way for you to help them is to calm down and get grounded. In a calm and centered state of mind, you are able to tap into the Universal life force Qi that surrounds us all. This is a limitless source of healing energy. Ever hear stories of prayer helping people heal? The connection of prayer allows life force to flow through you. When your mind is still, that’s also when brilliant inspiration and ideas flow too. There are many ways to connect to this Universal life force. This energy is incredibly rejuvenating and it’s my secret to looking so young! I’ve recommended this book to a number of readers and those that read it and follow it, report back to me months later how much their lives dramatically improved. You can often find a copy at your local library or get a copy of The Magic on Amazon . Have you ever noticed that you feel better and calmer when you spend time outside? Or even when you spend time with pets? There is a natural high frequency vibration that is the frequency of life and vitality. We lower our body’s natural vibration through stress, fear, worry, anger, etc. We also lower it by not tending to our bodies. E.g. eating bad food, not get enough rest, pushing ourselves to hard. Nature is automatically vibrating at this natural higher frequency. Thus, when you spend time in nature, you are recalibrating your body’s frequency so that it is closer to the frequency of health and vitality. There’s a reason why mediation is really popular. It’s medically proven to improve mood, help with sleep and even benefit people suffering from depression. There’s a ton of resources online on how to meditate. Give it a try. It’s as simple as paying attention to your breathing. That’s all you have to do! I find Abraham-Hicks videos to be really calming and expansive. You can search for their videos on YouTube, but if it doesn’t fit into your belief system, by all means, you can disregard this recommendation. I understand that not everyone’s cool with teachings from channeled entities. Choose what works for you. If you do enjoy their videos, they have a wonderful meditation CD that I highly recommend. If I had to credit one source with making a huge difference in opening up my mind to expansive opportunities and letting go of resistance, I would say that the Getting Into The Vortex: Guided Meditations is it. The CD contains four 15-minute guided meditations and They even have a meditation specific to healing your body. The kidneys in Traditional Chinese Medicine are considered the “root of life” and play an important role in your body, pretty much covering everything under the sun, but the kitchen sink. The perspective in Chinese Medicine goes beyond just the organs to encompass the entire meridian and the kidney’s relationship to other organs and meridians in the body. The kidneys play a role in reproduction, premature aging, digestion, weak knees, memory, teeth, and even psoriasis, just to name a few things that involve the kidneys. Massaging the kidney point helps clear toxins from the body and boost your Kidney Qi. The kidneys are the secret to health, vitality and longevity. I wrote about this in great detail in lesson 3 of the free online lessons, which if you haven’t gotten yours yet, you can sign up for them here and get some free Chinese Reflexology foot charts too. However, this is just a single point. In order to get the most benefit from Chinese Reflexology, see #7 right below. It doesn’t matter what’s going on in your body. Essentially, everything has its roots in an energy imbalance, blockage or deficiency in one or more of the energy meridians in the body. With Chinese Reflexology, it doesn’t matter whether there’s too much Qi or too little Qi in a meridian or if too much energy is concentrated in one area and not flowing sufficiently in another. The reason why it doesn’t matter is because when you massage all of your reflexology points, your body in its intrinsic wisdom knows what to do to rebalance itself. Going back to the psoriasis example I gave earlier, if someone had psoriasis on their chest, they might think that massaging the reflexology point for the chest area would be beneficial. While that’s true to a certain degree, what would be more beneficial would be to tackle the root of the psoriasis. The root would be a combination of Qi imbalances and deficiencies in throughout the energy meridians in the body. When you massage all of the Chinese Reflexology points, then you are supporting the proper flow of Qi throughout the body and balancing your body as a whole. You’re giving your body what it needs to turn your health around because when Qi flows as it should, the body heals. When it comes to the smooth flow of Qi, there’s a whole mental and emotional component that goes beyond Chinese Reflexology, but I’ll delve into that in future articles. Suffice to say, massaging all of your reflexology points is one of the best place to start. As your systems return to balance, you can simultaneously explore how to release the thoughts and feelings that led to the disruption in the flow of Qi in the first place. There are over 50 points in the complete system of Chinese Reflexology and at the heart of this style is the reflexology stick. While there is much benefit to massaging with your fingers and knuckles as directed in my articles, you’ll get much more benefit when using a reflexology stick. I estimate it’s at least 10x more powerful than massaging with your fingers when it comes to shifting the flow of Qi. As well, with so many points on your feet, your hands would get tired and you’d practice much less frequently if you had to massage all of your points with your fingers, knuckles and thumbs. A reflexology stick makes it easier and faster to massage your points and it also increases the effectiveness of the reflexology session. All of these factors add up to balancing and restoring your Qi faster and more effectively. I have one student who is a trained reflexologist in the Western style and she regularly massages her own feet. She told me that she was able to detect sensitive points with the reflexology stick that she was didn’t notice when she was simply massaging with her fingers and thumbs. A reflexology stick enables you to target your reflexology points with much more precision and intensity. However, with that power comes great responsibility which is why I do not sell reflexology sticks on my website. It’s important for you to learn how to properly use a reflexology stick rather than poking randomly on your feet. That’s because there are specific techniques for massaging different points, a prescribed order in which to massage the points and even the direction you massage a point can be of utmost importance. 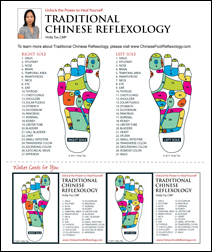 If you would like to learn the complete system of Chinese Reflexology, I teach it once a year, sometimes twice, depending on family commitments and time constraints. I’m planning to teach the program in late spring or early summer 2015, but I haven’t finalized it yet as there’s a lot of family stuff going on this year. We’re planning on moving to a new home in time for my son to start first grade, I’m busy writing my book for Hay House and we’ve got a trip to Canada planned. So, if you want to learn the complete system of Chinese Reflexology and how to use a reflexology stick, I’d recommend seizing the opportunity when I announce it in my newsletter, on my Facebook page and on my website. Please note that while the commitment for the program is not onerous in terms of time, I do require a serious commitment to study, learn and practice Chinese Reflexology regularly. When you invest in learning the system and are committed to making changes to heal yourself, that’s when you get the most benefit and see the most improvement in your health and vitality. If you’re serious about learning, I’m serious about teaching—although I do make it fun and easy to learn! In the meantime, keep massaging your feet. There is still much benefit in massaging with your fingers and knuckles. Some reflexology is better than no reflexology. And if you do want to learn more, keep an eye out for a newsletter or Facebook announcement. While I’m not able to answer everyone’s emails individually anymore, I hope in some small way that reading this article felt like I was writing it just for you—because I was! like you site . I do have a case of advance blocked cardiac arteries . I have tried the standard points but none seem to be doing the job. any help from your end of things. I’d advise you go see a medical professional and a holistic practitioner. Your condition is one where Chinese Reflexology would be best used as an additional tool to support your healing and you would need to practice the complete system (not just a few points) over a period of time while under supervision and with correct instruction. Of course, a lifestyle change is required too, in terms of diet and activity. It would also be beneficial to look into releasing the underlying emotions related to your condition. I recommend starting with Louise Hay’s book, You Can Heal Your Life.